Selling at JBF - Easy as 1-2-3! Sign up NOW for your FREE JBF account! You can choose to sell items and also register to HELP OUT at the sale and shop early, too! Bring your items to drop off at the time shown below. If you want to donate anything that doesn't sell, you're done! If you want to pick up unsold items, see times for that, too. Consignor checks are mailed within 2 weeks of the completion of the sale! JBF Richmond Consignors earn an average of $435 at each sale and you can TOO! • Consignors earn 60% less $10 fee which is taken out of your check so no upfront fees - yipee! • Consignors who are able to help anytime at the the sale for at least 4 hours earn 70% on their sold items. • Too busy to tag? Try our Valet Service. See details below. Be a part of the JBF Community and make YOUR sales event great! The online schedule will open January 20th! Volunteers who complete one 4 hour shift at the sale earn 70% on their sold items. Shop EARLY at Thursday's Presale. Shop EARLY at Saturday's Half-Price Presale from 6:00pm-8:00pm (up to 4 people per pass. Children welcome). Shifts are available in 4 hour increments. The more shifts you complete, the earlier you get to shop! The earlier you shop, the more merchandise and bargains to be had! Everyone welcome and no appointment required. 1. Prep, price and organize your stuff at home (see details below) and bring them to the fairgrounds ready to be SOLD! 2. Enter the Raper Center on the east side of the Building and check in at the Consignor Check-in table. You will need to turn in or fill out a Consignor Waiver, get your "I've checked in" sticker, pick up your presale passes and signup for a volunteer shift if you would like to earn an additional percentage on your sold items (if you haven't alread). If you are consigning a car seat, car seat base or crib you will need to complete these additional waivers. 3. Grab a rolling rack to help unload your items from your vehicle and bring them inside. Rolling racks are available on a first come, first serve basis and are inside near the consignor check-in table when available. 4. We recommend having your items sorted by size and gender to make your drop off process smoother. 5. If you are selling baby equipment and larger toys (pack-n-plays, car seats, bikes, jump-a-roo's, strollers, car seats, furniture, etc.) these items will go towards the south end of the building. 6. Inspection of clothes and shoes will take place after you drop off. So you can go ahead and take your clothing items to the racks and place them in the appropriate sizes. Place shoes in the designated marked size bins. All items pulled for rejection will be scanned & marked. If you are donating, they will be donated to our charity partners. If you are picking up, they will be sorted with your unsold items to gather at consignor pick up. For detailed information about the new inspection process please review "clothing" tab below. 7. Watch your sales grow with our real-time updates. Cha-Ching! You have a choice! You may donate your unsold items to our charity partner OR pick up your unsold items. If you donate your items, you will be helping our local community + receive a letter for tax purposes with your consignor check. If you pick up your unsold items, they will be sorted by Consignor/Seller number for your convenience. At 7:01pm remaining items are donated to our charity. Sorry, no exceptions! Diaper bags, infant carriers, backpacks, lunch boxes and kid's purses are great consignment items. Please inspect all items carefully to make sure items have not been recalled, stained, damaged or are missing pieces. Tag: Hole-punch the tag and attach it to the item with ribbon or string. If the item contains multiple pieces, be sure all pieces are included and list number of items on the tag description. Click on the "view tutorials" link below to see easy how-to tagging videos. Be selective when selling blankets, receiving blankets, burp cloths, and towels. New and barely used items sell best. Check carefully for stains; shoppers get very disappointed if they find a stain in a bundled blanket or lot of bibs once they get home. Package: Larger blankets should be placed on a hanger. Receiving blankets may be placed in to ziplock page wth the tag taped to the outside of the bag. Secure the bag so that items do not get separated. Bundle blankets, cloths, and towels with ribbon or string like a package (be sure multiple pieces cannot be separated). Price: Price to sell! Shoppers are less likely to purchase these items used, so prices have to be low. Price 75% - 90% off retail. Tag: If the item is placed in a plastic bag, attach the tag securely with packaging tape to the inside of the bag and tape the bag shut. If blankets are bundled with string or on a hanger, attach the tag directly to blanket with a tagging gun or safety pin. Books, book sets, board games, puzzles, video games, video game systems, scrapbook, arts & crafts sets are great items for resale. In addition to chidren's books, we accept parenting, homeschooling, pregnancy and child rearing content. Games and puzzles must have all pieces. No "adult" content, rated "R" DVD's or rated "M" video games. We are unable to accept VHS tapes. Check dvds and video games for scratches and double check to ensure the disk is in the case! Tag: When tagging books, please attach your tag to the book with clear tape or blue painter's tape that can be removed without damaging the item. Tape the tag to the outside back cover. Please do not use double sided tape on the books themselves. Hole-punch the tag and tie to sets. Before you start entering your clothing items, please inspect them being sure you are following the JBF guidelines for quality. Do not sell any items that have stains, tears, holes, rips, are too worn, or out of season. Per the consignor agreement, as a result of our new easy drop off and inspection process on site, all consignors are able to have up to 5 items pulled for quality at the sale. After 5 items, you will be charge a $.25/pulled item fee for any clothing/shoe item that is rejected. Those fees will be taken out of your check. Quality: Be picky. Look at your clothing items as if you were going to purchase them. No stained or damaged items will be accepted. Any items that look like "mom's" clothes will be rejected at inspection. Please freshly clean your clothing items. Replace missing buttons, sew loose hems and seams, and clip loose threads. Button all buttons, snap all snaps, zip all zippers before you arrive at drop off. This will ensure that there are no defects in the clothing. The newer the item looks (and the better it smells), the more you will sell. Package & Hang: Hangers - Please hang clothes so the hanger hook points to the left (like a question mark). Hang size 0-5 clothing on child-size hangers and sizes 6-20 and maternity clothing on adult-size hangers. See below for a helpful guide on where to find FREE or low cost hangers. Clothing Sets: Sets tend to sell better (under size 6) so match things up if you can. All garments should be hung with the hanger hook pointing left (hanger should resemble a question mark when looking at the front of item). Safety pin or use a tagging gun to attach clothing sets securely with bottom garment hung on the backside of the shirt, so both pieces can be viewed without separating them. Pants/Shorts - Pant-clip hangers are great but if you use a standard hanger, simply use your tagging gun (or safety pins) to attach pants to the top part of the hanger so the garment will not slide. Onesies, socks, tights, hats and infant mittens need to be in a clear zip-lock bag (you may group multiple items in one bag). Please be sure to label your tag well so that customers know if the items are short-sleeve onesies or long-sleeve onesies. We DO NOT have a $3 rule at the JBF Richmond sale. We encourage you to price your items competitively and use the pricing guide below as a resource. You are welcome to use any type hanger at the JBF Richmond sales events. Tag: Clothing on Hangers - Attach the tag with a tagging gun or safety pin to the label of shirt or upper right front of pants. Insert the gun in a label or inside seam NOT through part of the clothing (to avoid making a hole or tear in the clothing). Also, pull on the tag to make sure it is properly secured and will not come off easily. Please make sure consignor tags are pulled out of the clothing so they are easily visible to the customers. Exersaucers, swings, high chairs, changing tables, strollers, bath seats, baby walkers, car seats & car seat accessories must be checked for safety recalls, include all parts, and be in good condition. PLEASE NOTE, we can only accept cribs if they have a certificate of compliance from the manufacture. Children's furniture like beds (toddler & twin, unless part of a recalled crib), desks, side tables, dressers, etc. are a-okay too! Package: If the item has multiple pieces use packaging tape, zip-ties, or string to keep items attached together. If wooden furniture has loose parts, use clear plastic wrap or clear self-seal bags to secure the item. All furniture and equipment must be assembled during the sale. Batteries must be included, if applicable. Please bring a Car Seat Waiver for all car seats, booster seats, and car seat base or infant carrier. Nursing covers & pillows, feeding items, monitors, safety items, diapering & toileting items, rattles, breast pumps and more. Check for safety recalls on all items that you consign. Tag: Attach the tag directly to item or clear self-seal bag with clear packaging tape or hole-punch the tag and tie it to item. 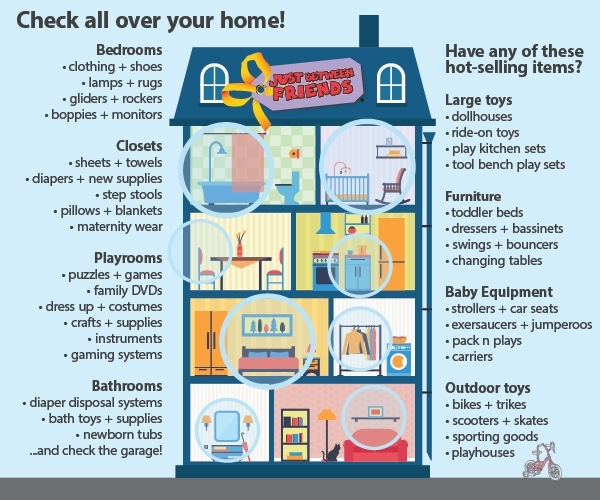 Household items that other families will use (no knick knacks please). You may consign storage solutions (baskets, bin, shelving), furniture, decor (lamps, wall hangings, no antiques), and kitchen items (small appliances, utensils, etc.). Make sure that shoes are clean, clean, clean! We will be VERY selective with shoes during Consignor Drop Off & Inspection. Shoes must be current season (October = Fall/Winter; April = Spring/Summer). Tag: Punch a hole in the top of your tag and attach the tag to the shoes with the ribbon, string, or zip tie. For infant shoes in a clear self-seal bag, put the tag inside the bag and tape the bag shut. Ride-on toys, block sets, dolls, remote control cars, outdoor toys, learning toys, and more sell like HOT CAKES. All toys must be checked for safety recalls before consigning. View the Safety & Recalls link below for additional information. We accept stuffed toys that are characters (such as Mickey Mouse or Dora), pillow pets, battery operated (like Tickle Me Elmo) or brand new with tag. Please, no generic stuffed animals. Tag: Attach the tag directly to item with clear packaging tape or hole-punch the tag and tie it to item. Consignor Mentor - Need help or have a question? Michelle is available to help and is standing by! Email, text or call - we are here for you! 317-626-1637. Consignor Facebook Group - join an exclusive facebook group where tips, helpful resources and advise from veteran consignors are shared! Do you have more "stuff" than time? Consider our Valet Tagging service. 3. Drop off your clothing items as well as other "stuff" like toys, baby gear, games, books, puzzles and whatever else you can find for your tagger. Review our Tips & Reminders for easy drop off. Provide the completed waiver to your tagger. 4. Your tagger will prep, price, and tag your items. 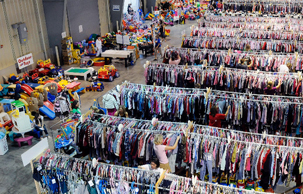 For an additional fee, your tagger can store and place the items on to the sales floor as well. Pick up of unsold items is the responsibility of each consignor unless other arrangments have been made with the Valet tagger. Valet Consignors earn 45% of the sale price of your items less a $15 supply/consignor fee. If you help at the event for one 4-hour shift, you will earn an additional 10% less the same $15 fee. We'll also give you presale passes for you and 1 guest which will be held at the door with our greeter or mailed to you a week prior to the sale. We are offering a select number of Express Drop Off Appointment times. Mark ALL of your items to reduce on half price day & also to donate to our charity partner what doesn't sell & you QUALIFY For the New Express Drop Off Option For FREE! Click here to schedule your special appointment time. When it's time for your appointment time, pull up and park at the east end of the Raper Center in front of the big overhead door, come in to get checked in, drop off your items at the special marked express drop zone area and you're on your way. Contact us if you have any other questions regarding this service. We only have a limited # of these FREE Express Drop Off spaces available, so if you know you want to participate, schedule your appointment ASAP. Quick Downloads for Seller Success!